"Sampath Speaking" - the thoughts of an Insurer from Thiruvallikkeni: Vizag Test - What will happen ? or is it simply When will it happen ?? Vizag Test - What will happen ? or is it simply When will it happen ?? At Vizag, Indian fan is hoping a meek surrender this morning and an Indian win – what does British Press think about the 2nd Test at Vizag day 5 today ? The Sun UK captions ‘Cookie crumbles’ : India vs England day four: Hammer blow for Alastair Cook as skipper falls to last ball of the day after England launch spirited fight-back in Second Test. According to the report, the last ball of the day swung the pendulum a long way. 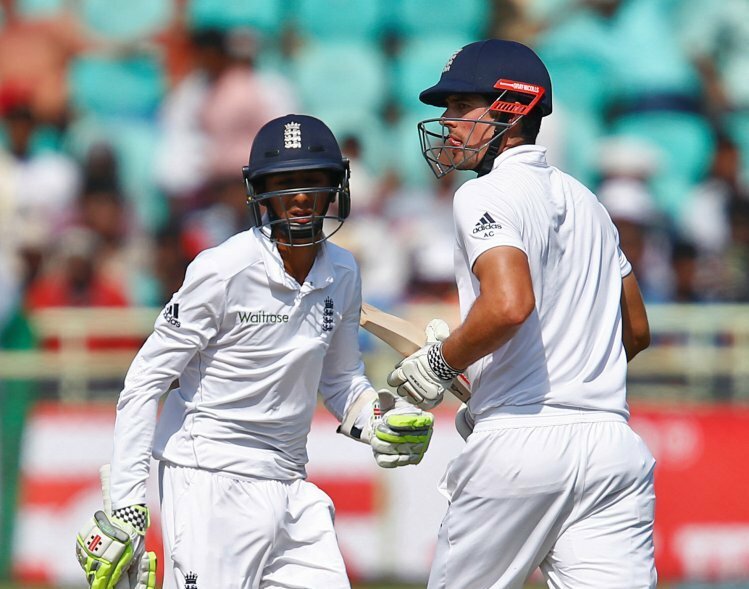 Alastair Cook, after 59 overs of diligent self-denial, pushed across the line against Ravindra Jadeja and was lbw for 54. Thus a brilliant, passive response to the targets of batting for five sessions or scoring 405 runs – both of which would be historic – was badly diminished. Until then England, who have battled so hard since that self-destructive session on the second evening, had caused considerable headaches for Virat Kohli and his men. At the close of another gripping day of Test cricket India needed eight more wickets for victory; England required a much less likely 319 runs to win. This was England’s best day of this Test so far, but they aren’t any closer to winning it, and only slightly closer to salvaging a draw. That is an adequate summation of just how far behind they were in this match before the day began. A decent bowling effort on the fourth day of the second Test in Visakhapatnam saw them dismiss India for 204. Four wickets a piece for Stuart Broad and Adil Rashid meant that India lost seven second innings wickets for 106 runs in the morning session. That is, objectively, a fine performance from the England team. The issue was, just like buying your wife expensive jewellery the day after your wedding anniversary, it was too little, too late. However, the reason why a draw is so unlikely on this pitch was summed up by Hameed’s dismissal. Hameed played his first truly attacking shot to the 130th ball that he faced, drilling a ball from Ravichandran Ashwin over the top for four runs. He had got himself set for the long haul. Then, on 25 and facing up to the 144th ball of his innings, a delivery from Ashwin shot along the ground and dismissed him LBW. It was a brutal way for it to end, but there was little that the young Lancastrian could do about it. While someone in 20 years’ time may glance down the scorecard and see Hameed was run out on 13 in the first innings and lbw for 25 in the second, the numbers will not tell them about Joe Root’s calamitous call on Friday nor the manner in which Hameed’s 188 minutes and 144 balls of pressure-soaking batsmanship ended. The courage shown after a blow to his little finger, first ball from Mohammed Shami, will similarly go unsaid. Indians who have never been comfortable with DRS will continue to rue. Jadeja bowled to the England captain Alastair Cook outside off-stump; the ball turned and took the pad; the batsmen ran a leg-bye to discover that India were asking for a review. It was not the worst review of the series by a long chalk, but the outcome to Cook’s relief was two reds and an orange. Had it been an ordinary Umpiring decision, it was out – as replays showed that bails would have been dislodged… again in the next over Ravichandran Ashwin bowled and Cook prodded forward; the lbw appeal was rejected, whereupon Ashwin had his way and the review was sought. Once again it was tight but the umpire’s original decision was upheld. On both the occasions, crowd rejoiced on seeing TV replays – but for DRS all 3 have to be in place, otherwise, it gets referred back to Umpires decision. Rod Tucker and Kumara Dharmasena were unwilling to correct themselves thus exposing their act as a mistake… the fate of England could well have been different. Ben Stokes is hungry for runs and can devour bowling — now he must learn to eat while he is batting. Guardian reveals that all-rounder Stokes suffered from cramp during the First Test against India because he did not consume anything while scoring his century. Not an energy bar, fruit or anything else passed his lips. And certainly not the local diet of curry and rice. It has become a significant issue in a series where daytime temperatures rarely drop below 35C and players must take on board food as well as fluids. As he prepared for Second Test, Stokes explained: “I can’t eat when I’m not out, I don’t know why. Our physio and doctor were trying to force feed me pretty much but I literally can’t eat, not even a protein shake or anything. “I’ve never been able to do it. That was the reason for the cramp, yes, so the medical people are on my case to make sure I eat whenever I can. I eat on a bowling day, yes, but when I’m not out I can’t eat anything, not even a banana. “It doesn’t really affect me in England because it is always freezing. But cramping does relate back to not eating. When I came to bowl in Rajkot, I was a bit worried about cramping up. It took a few balls to realise that I wouldn’t. So, is the Q what would happen or simply when it would happen ?